Breakfast at Sotheby’s: an A-Z to the Art World by Philip Hook (published last month by Particular Books) is a great read for those who want to freshen up their knowledge of art lingo and cultural fait divers. The book is a page turner and the author – who earned his stripes both as an art dealer and as a director at Sotheby’s and Christie’s auction houses – is very generous in sharing his insider’s knowledge. Philip Hook starts by explaining which questions people ask when they see a work of art in a museum: Do I like it? Who is the artist? He then weaves in the financial dimension by presenting three additional questions that pop up when seeing an artwork in the context of an auction or in a commercial gallery: How much does it cost? What will be the future price? What will people think of me if I have this piece on my wall? The diverse factors that influence answers to these questions are discussed in the five chapters that follow: The Artists and His Hinterland (overview of the archetypes and the stereotypes of an artist – the romantic, the rebel, the mad genius, artist as a brand, female artist…), Subject and Style (why certain themes and styles sell better than others), Wall-Power (what makes us like an artwork), Provenance (how former ownership and history of an artwork influences its market value) and Market Weather (other external factors, players and moves on the exciting art market chessboard). The subchapters are arranged alphabetically, which often leads to funny and curiosity–enticing entries (R is for Railways, O is for Off-Days, F is for Football) and the A–Z classification is further highlighted in the Glossary subchapter – a dictionary of a must–know expressions for every aspiring art savant. Philip Hook’s writing is amusing and smooth but it would be great to get a little bit more under the skin of what he learned about the art(world) and its value(s) in the course of his career at the two top auction houses. Sometimes it feels that he plays a bit safe by focusing primarily on the past (Christie’s in the 70s, collectors and dealers of the 20th century, wartime expropriation of art by Nazis) and less on the present controversies. Why not adding a story about how Saatchi’s buying low & selling high of young artists influences the market in the chapter about Provenance? Or what about using Damien Hirst’s coup d’état in 2008 by cutting out his gallery and selling directly to collectors through Sotheby’s as a story about the power in the market? What could have also been expressed more clearly was a bridge between the initial set of questions and the five chapters. Without defining that art valuation is in principle based on a hedonic pricing model*, and explaining the term in more detail, one might end up reading the book as a collection of enjoyable, but loose, stories, connected mainly by the alphabetic structure. Nothing wrong with that, but you’d be missing an important asset, which is how the individual stories tie together to help you understand – in a simple and entertaining way – the different dimensions an art professional looks for when trying to put a value on an artwork. Conclusion: we really enjoyed the book. It’s a good read plus it will put you in a comfortable position to join a discussion about art & money at a Christmas party! 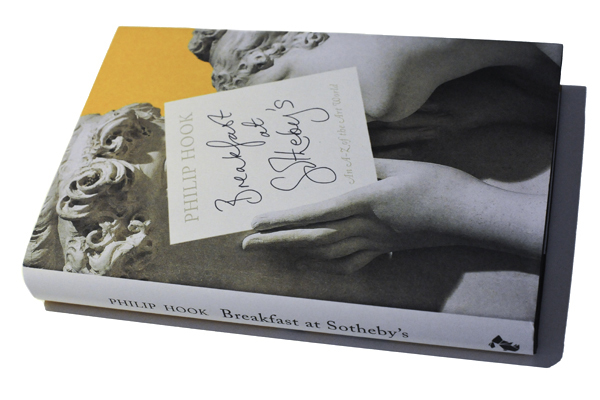 Breakfast at Sotheby’s: An A–Z of the Art World by Philip Hook is published by Particular Books, an imprint of Penguin Books, and it is available in bookshops or online. * An economic model commonly accepted by art market professionals but used also in other markets, eg. the real estate. It is used to estimate value by taking in account diverse factors, both internal (author, size, media, topic, style etc.) and external (provenance, exhibition history, scarcity & demand, popularity at a certain moment, financial market and economy health at large etc).